With an ideal position at the centre of the city and a beloved place in Russia's heritage, the new Four Seasons Hotel Moscow will soon reopen the doors to first class dining establishments, refined meeting and event spaces and the capital's finest accommodations, plus an all-new destination spa presented with warm, friendly and unparalleled levels of service. Reservations are now open for arrivals beginning October 30, 2014, and General Manager Max Musto can't wait to welcome the Hotel's first guests: "Every day we feel the excitement all around us," he says, referring to the Hotel's prominent location just steps from Red Square, the colourful domes of St. Basil's Cathedral, the world renowned Bolshoi Theatre, the prestigious GUM shopping complex, and much more. "In just a few short months, Four Seasons Hotel Moscow will become a central player in the incredible unfolding narrative of modern Russian culture." Originally built in the 1930s with Joseph Stalin's approval, Hotel Moskva saw many chapters in the Russian saga - and might have even shaped a few. As an unofficial home base for the Soviet Union's political and cultural power players, the hotel also hosted a star-studded cast of international guests. Even today, the landmark facade is instantly recognizable the world over as it is immortalized on the label of the famous Stolichnaya vodka. Now, with immense respect for architect Alexei Shchusev's original vision for the 15 storey building, interior designers Richmond International have created a contemporary homage to history that is firmly positioned in the 21st century. Its fashion-forward style and modern comforts set the stage for the unmatched level of service enjoyed by Four Seasons guests around the world. The exterior facade has been replicated in meticulous detail, including the distinctive asymmetry between the two wings that surround a new glass-topped atrium. Although totally rebuilt to today's highest standards of construction and engineering, echoes of the past are seen inside as well, such as the column capitals and scalloped rosette surrounding the main ballroom's chandelier, and handcrafted mosaic tiles in the glass-enclosed pool area. From a grand entrance facing Manezhnaya Square, a magnificent lobby sweeps by reception areas and lively lounges and up through to a second floor atrium and two world-class restaurants. Natural light abounds here, as in all the Hotel's public spaces and its guest rooms. Along with the state-of-the-art technologies that characterize the new building, modern culture is also on display in the form of a collection of contemporary Russian art throughout the Hotel. With many of the 180 rooms and suites boasting postcard views, Four Seasons Hotel Moscow will offer some of the city's most spacious accommodations, all featuring the new customizable Four Seasons Bed. Floor plans range from a generous 48 square metres (517 square feet) for a Deluxe Room to the palatial 520 square metres (5,600 square feet) of the Pozharsky Royal Suite. Easily claiming the best location in town, this suite is located on the 7th floor, with an expansive terrace offering views of Manezhnaya Square and Alexandrovsky Garden. Equally impressive is the stately Minin Presidential Suite at 468 square metres (5,000 square feet). Five two-bedroom Grand Premier Suites are located in the building's coveted corner positions facing Red Square. All accommodations are bathed in natural light through floor-to-ceiling windows, and many have step-out balconies. Thoughtful features include ergonomic furnishings and large working desks, in-room Nespresso machines, and high definition televisions that swivel to show a mirror on the opposite side when not in use. Technological innovations include iHome docking stations, media hub with international socket options, high speed internet access, and an iPad in each room that allows guests to peruse hotels features and services, book in-room dining and Spa appointments, and more. Marble bathrooms include separate showers, with complimentary custom amenities by Roberto Cavalli. Guests are pampered with twice daily housekeeping, overnight shoeshine and laundry, and 24-hour in-room dining including the innovative Four Seasons 15-Minute Room Service menu. The multi-lingual concierge team is ready to assist in planning bespoke itineraries, and the 24-hour business centre provides support to travellers away from their home office. Families are welcome with an array of special surprises and amenities for younger guests, as well as small pets. Renowned Chef David Hemmerle has returned to the city's burgeoning restaurant scene to lead the culinary team at Four Seasons Hotel Moscow. Already well known for his creative work at the Cristal Room Baccarat and his former restaurant Carre Blanc, Chef Hemmerle will oversee all restaurants and lounges, as well as in-room dining and banquet menus at the Hotel. 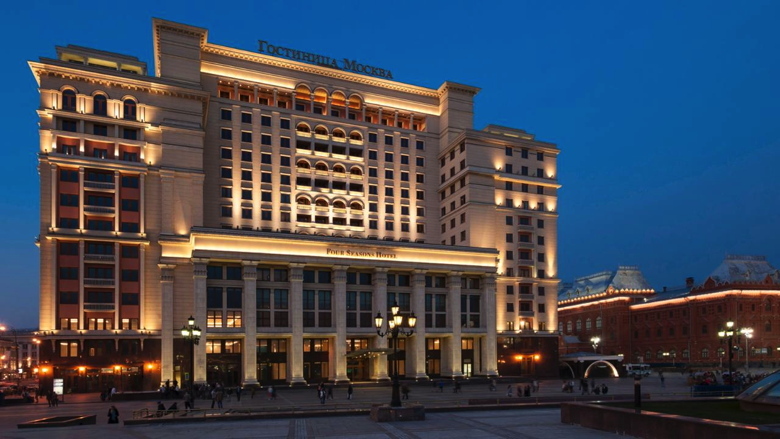 Two signature restaurants are at the heart of Four Seasons Hotel Moscow, including Quadrum, the Italian dining establishment on the Hotel's second floor facing Manezhnaya Square. A changing seasonal menu of authentic regional pasta, carne and pesce will feature the finest local and imported ingredients, accompanied by a deep wine list and served in an atmosphere of casual elegance. Hotel guests and locals will also gather at the second story Bystro for breakfasts, and in the evening enjoy a dinner menu featuring Russian Nordic cuisine. Set to make its mark on the city's dynamic social life is the street level Moskovsky Bar. With dramatic red and black interiors, the high-style cocktail bar will also offer a comprehensive selection of Champagnes, wines and spirits. The sophisticated yet informal Silk Lounge flanks either side of the lobby level, with two large welcoming fireplaces around which to meet friends for afternoon tea and pastries or colleagues for a drink. In addition, the Amnis Cafe will offer light lunches and pre-and-post Spa refreshments by the pool on the fifth floor. Up on the Hotel's fifth floor, the Amnis Spa at Four Seasons will be an exclusive retreat from busy urban life for Hotel guests and day visitors. The centre of the almost 3,000 square metre (more than 28,000 square foot) complex is the mosaic-tiled indoor pool, naturally lit from above by a rectangular glass roof. Here, guests can swim laps, relax in lounge chairs or enjoy healthy refreshments from the Amnis Cafe. A menu of massages, facials and body treatments inspired by Russian traditions as well as the latest in international therapies will be offered. The Spa's 14 treatment rooms include three double suites for couples. A hair salon and nail bar are also planned, alongside a 24/7 fitness centre with state of the art equipment by Life Fitness. Whether coming together for business or pleasure, Four Seasons Hotel Moscow promises the exceptional service and attention to detail for which the brand is renowned all over the world. Set apart from the busy ground floor, two ballrooms and five smaller meeting rooms on the second and third floors provide 1,406 square metres (15,123 square feet) of options for groups from 20 to 500. The plush Tchaikovsky Ballroom encompasses 530 square metres (5,700 square feet) plus an adjacent pre-function area and step-out balcony above Manezhnaya Square, with partial views of Red Square and the Kremlin. Richly appointed with Corinthian columns and crystal chandeliers, the space is also fully functional with drop-down screens and projectors. Reached via a marble staircase or dedicated elevator and a private entrance at street level, it's ideal for hosting social functions, as well as providing direct access for those who do not wish to enter through the busy main lobby. The 7th floor terrace, with its dramatic views of Manezhnaya Square and the Kremlin, also invites creative functions from cocktail parties to pop up lounges. For brides and grooms, Four Seasons Wedding Specialists work closely with the couple to make their dream wedding a reality. Every detail is anticipated and executed to perfection, allowing the happy couple, their families and guests to enjoy the day. And, Four Seasons Hotel Moscow is just steps from Alexandrovsky Garden for the traditional wedding-day visit to the Eternal Flame at the Tomb of the Unknown Soldier, as well as numerous photo opportunities in the surrounding gardens and squares. Four Seasons Hotel Moscow will join the newly opened Four Seasons Hotel Lion Palace St. Petersburg, a meticulous restoration of a 19th century palace adjacent to St Isaac's Cathedral and just steps from the Winter Palace. Paired together, the two destinations offer a perfect opportunity to experience modern Russia's delights while glimpsing its storied past.